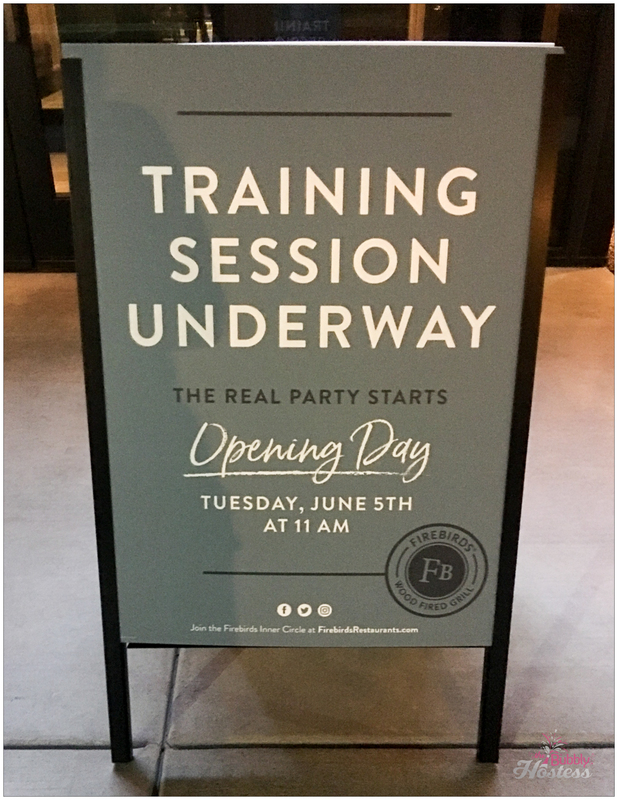 We were very excited when we learned a Firebirds Wood Fired Grill was opening not far from our home and was even more excited when we were invited to the soft opening! There was a lunch and a dinner option – so we chose the dinner the night before opening day. The new Firebirds Gilbert location is located near San Tan Village at 1930 E Williams Field Road. 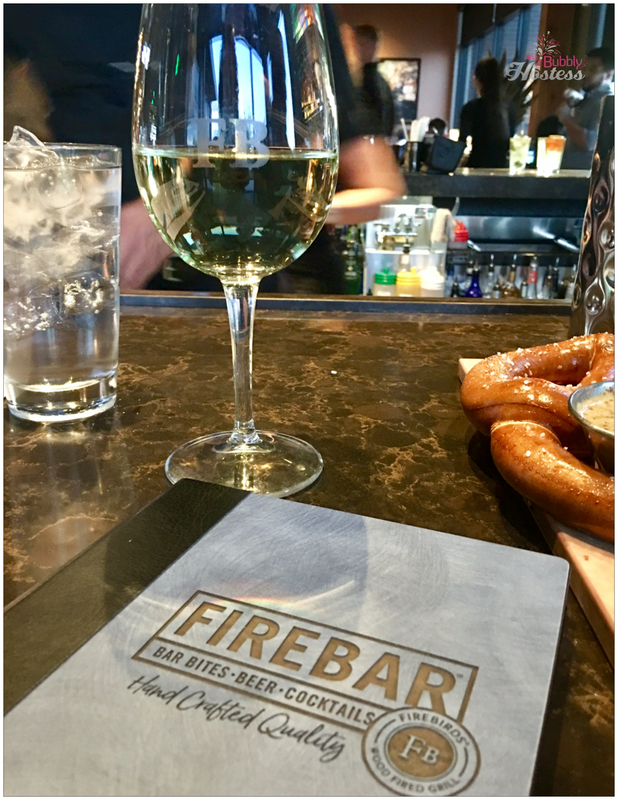 Our reservations were at 7:30 p.m. and once we were there, decided to enjoy our meal at the bar. 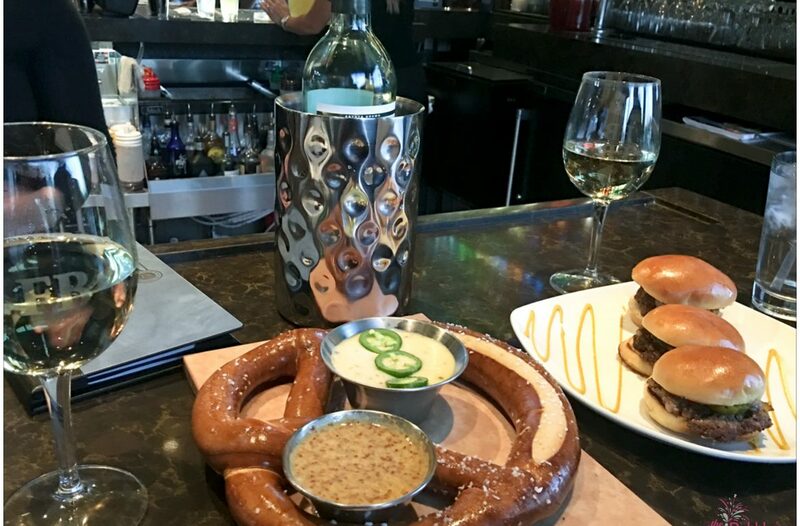 We have young children, so it isn’t often that we dine at the bar – it’s always fun to meet and talk to the bartenders as well as those around us (we think so at least!). 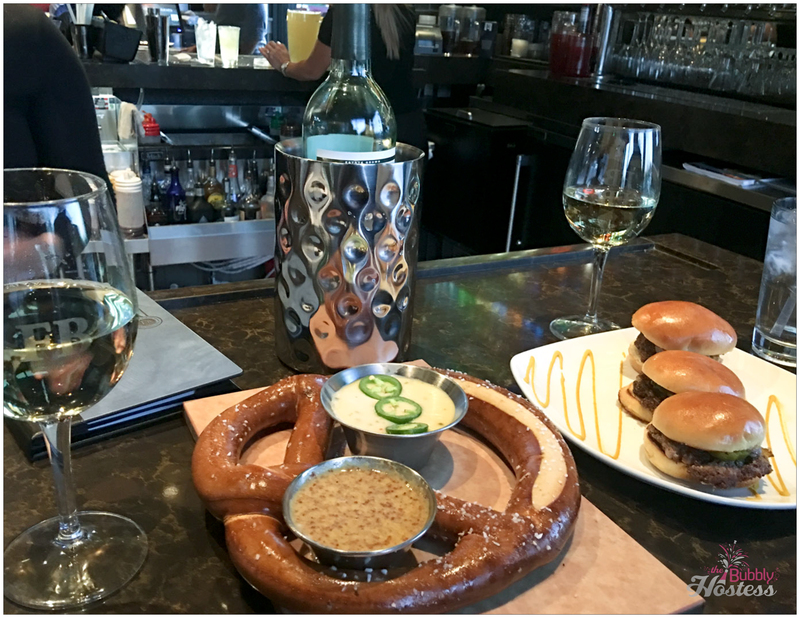 We started off by ordering a bottle of St. Supéry Sauvignon Blanc and were almost immediately brought out two appetizers to share from their Firebar menu. These included the Bavarian Pretzel with Samuel Adams Beer Cheese along with the Beef Sliders. Along with the cheese for the pretzel came this amazing mustard dipping sauce – it had the perfect amount of horseradish to heat things up! For our next course I decided to order their Mixed Greens Salad which included tomatoes, spiced pecans and jicama tossed in a cilantro-lime vinaigrette – it was delicious! The Hubby enjoyed the soup of the day which was a Manhattan Clam Chowder. We both chose the 7 oz Filet Mignon as our entrée that was wrapped in applewood-smoked bacon – I of course added the blue cheese option to top off my filet..I can never resist that! All entrées are served with your choice of broccoli, loaded baked potato, Parmesan mashed potatoes or seasoned steak fries. We both indulged with a loaded baked potato. 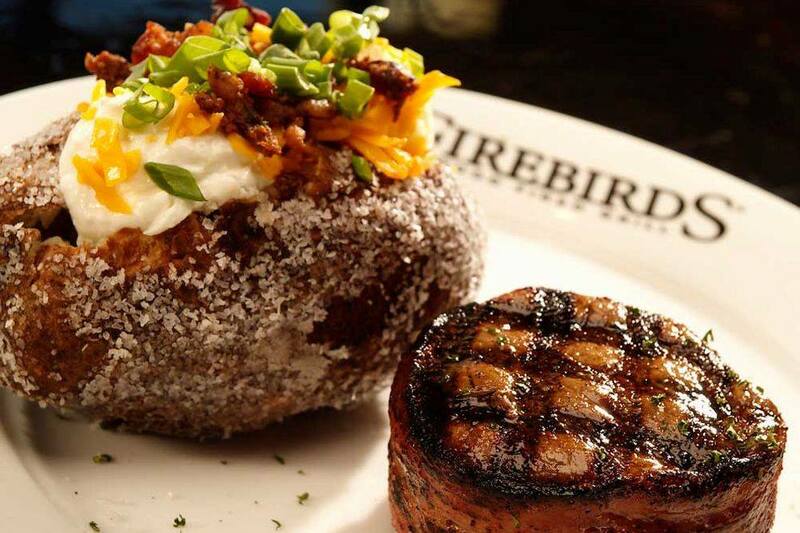 Firebirds Facebook page had a much better photo of their filet and baked potato than the one I took – so that’s what you see here! After all of that food, we were way too stuffed to eat dessert as well – but their selection looked pretty awesome. We had plenty of “to go” boxes to take home with us! We will definitely be back to our now “local” Firebirds Wood Fired Grill – and with a diverse Kids Menu, we’ll be sure to take our boys with us as well. The Gilbert location opened their doors for business on 6/5/18 – if you live in the area or are visiting, I would highly recommend dining there. 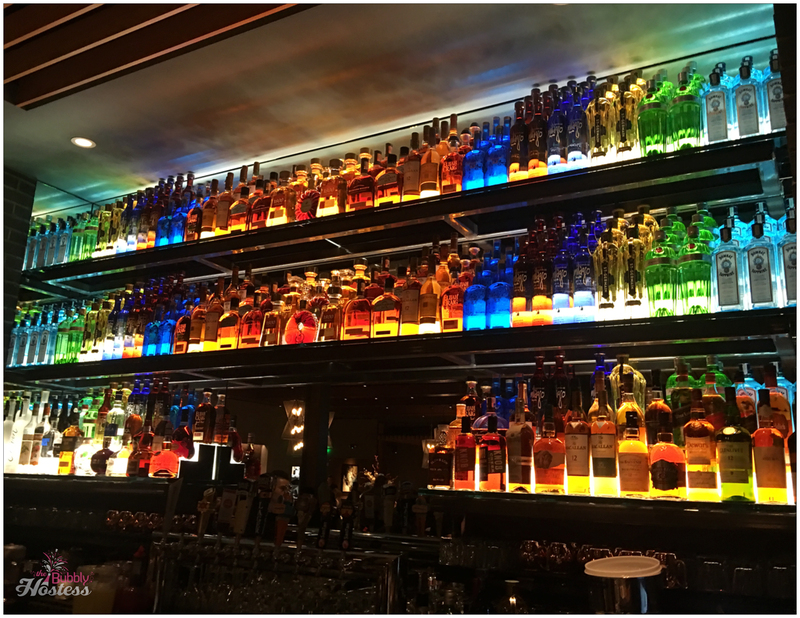 The service, food, and atmosphere were all fantastic during our experience – cheers!